It was the British who first introduced Cricket and Tea to this country. The Cricketing voyage you are about to read, started over 150 years ago, and the adventure of Tea, about a decade and a half later. Like our Cricket, the epic saga of "Ceylon Tea" continues to enthral the world. Read more about this enchanting story, at the end of this Webpage. Its titled "A Glimpse of a Second History - Ceylon Tea". Ceylon Tea, Sri Lankas gift to the world, promotes well-being. Its a Beverage like no other and panacea for illnesses. Look for the "Lion Logo" on every pack you buy. 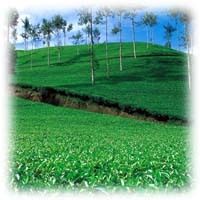 It's your guarantee for Quality pure Ceylon Tea, packed in Sri Lanka. No: 574 / 1, Galle Road. Colombo 3. THE LONG ROAD TO TEST STATUS. The first 'All-England' played 'All-Ceylon' in 1882 and the first 3-day match in Ceylon was played in 1889. However, Sri Lanka (Ceylon then) is the only 'Test-playing' Country made to travel a very long gruesome path to gain the ICC full membership. This lasted almost one hundred years until 1981 and saw 51 'unofficial' test matches in addition to numerous international games being played. From 1975 until 1981, Sri Lanka's application for full membership was put off year after year. It was then left to the eloquence and impassioned plea of Mr. Gamini Dissanayake, the Minster for Lands and Mahaweli Development and also the dedicated President of the Board of Control for Cricket in Sri Lanka (BCCSL), to win for us the 'right' to be where we are . He had hardly played even junior level cricket but studied his subject and had the Cricket - educated ICC audience listen to him intently. As a result, Sri Lanka gained 'Test Status' on 21st July 1981 by a unanimous vote of the test playing countries. His monumental efforts include introducing Cricket as a profession and as a new wage-earning concept and also building a home for cricket administration on land leased from Sinhalese Sports Club. This was the culmination of a 'Cricketing Voyage' that began well over 150 years ago in mid 19th century, through the genius and immense skills of a rich plethora of players abounding with natural talent and sets of illustrious Cricket Administrators. Coming in to 'Big League' (Test Match Cricket,) was not something that happened even after 100 years for us. This is the long long story of sweat, tear and toil of our 'Cricketing Forefathers' who lit the torch and carried the flame through infancy to ultimate fruition almost 150 years later. Remember, it was the era where they did not have tools and ingredients which we feel today as vital and essential, in the form of infrastructure, continuous encouragement, assistance, lucrative awards, sponsorships and money, but had in their possession 'wealth' in the form of commitment to the Game and the feeling of "Country rather than to Self " at all times. It is from them only, the present generation has inherited its ability and planted prominently this 'Emerald Island' in the cricketing map of the world. FOUNDATION LAID AND PLATFORM SET. Cricket was first introduced to Ceylon (Sri Lanka now) by the Englishmen who occupied the martime provinces in 1796, the pioneers being the militia-men in Colombo, Trincomalee and Galle along with the early coffee and tea planters in the central highlands. There is no record traceable of cricket having been played in Ceylon prior to 1832, but every possibility is there that the British military units then here, would have played the game earlier. In fact the first match in Ceylon on records was between a Military XI and the Civilians of Colombo. When the whole island came under the British Empire and its Rule by 1815, there was an influx of British here, not only as planters and military men, but even as educationists, administrators, etc. Amongst those were county players, cricket enthusiasts and even academics such as Cambridge and Oxford 'Blues'. We owe a great debt of gratitude for the splendid foundation they then laid for the game here. Thus was set the platform of our cricketing heritage. A leaf disease in 1865 ruined the coffee industry here almost overnight. Recovery began through 'TEA'. This brought more young men from the English public schools and universities, sportsmen and even a Lord or two. They also made 'Ceylon' the leading 'Crown Colony' of the British Empire. In fact records indicate that in an introduction by (Sir) Pelham F. Warner to a book on Ceylon Cricket it is noted that, "there is no place in the British Empire where Cricket is played more enthusiastically and in a finer spirit than in Ceylon ". The forgotten personality today in the Sri Lankan Cricket Heritage who had a very big hand for that was Ashley Walker M.A., of whom I will write later in this article. It was Kandy District and not Colombo, that first became the hub of early cricket activity in Ceylon. Athletic, Boating, Cricket and Dancing (ABCD) Club in Kandy were the pioneers of Cricket and fielded a very strong, exclusively European cricket team. In fact these men, carrying their cricketing gear and other material had to walk on foot and then back also, for miles and miles for a game that started at 7 a.m. with a 3-hour break for lunch to avoid the noon-day hot sun. These hardy planters, soldiers and sailors in playing on under-prepared rough turf, always had danger to life and limb. However, they not only kept Cricket (and Rugby) alive, but promoted it under such difficult circumstances. "The Colombo Journal" was the only newspaper in and around 1830. In September 1832 it had carried a notice towards establishing a 'Cricket Club' requested those gentlemen who may feel inclined to lend assistance towards this, to be present at the Colombo Library on Saturday the 8th September at 2 O'Clock precisely. This newspaper then had reports to say that the "Colombo Cricket Club" met the 97th Regiment in a game in Colombo in November that year, at the Army's Rifle Parade Grounds, (the present Rifle Green) . This is said to be the first recorded Cricket match played in Ceylon. Rev. Joseph Brooke H. Bailey M.A. (Edin.) an excellent cricketer, then came to Colombo as Assistant to Head Master to the Colombo Academy (which later became Royal College Colombo). He is regarded as the 'First' to introduce Cricket to this School (and also to Ceylon Schools) and did much to make the game popular amongst the local population during his era (1835 - 38). 1864 saw the first cricket match in which a School played. It was when St. Thomas's Collegiate School Mutwal (founded in 1851) playing Small Pass Cricket Club in Dam Street (Colombo 12) . It was also the first recorded cricket match between two Ceylonese teams. The First 'Big Match' in Ceylon on record took place in Kandy on 5th August 1867, between the Central Province and Colombo and the match is reported to have ended in a tie. 1869 saw the formation of the 'Dimboola-Agrapatana Cricket Club and soon thereafter opening of the most picturesque cricket ground, Radella. At 6,600 ft. above sea level, it is said to be the Ground at highest altitude at which cricket is often played today in the world! From 1873 onwards, this big match changing names to 'Colombo vs Up-Country' had been played annually. By then DACC along with Dickoya-Maskeliya Cricket Club (DMCC) with their Grounds at Darrawella, established themselves as the premier Cricket Clubs of Up-Country. Number of Cricketing Stalwarts who were men of integrity, fostered the game here in its infancy providing encouragement for further advancement with time. ; Their names and exploits to be named even in a nutshell, will need volumes. Hence I am compelled to limit that to a handful with reluctance. Ashley Walker (Cambridge (1864-66) and Yorkshire) about whom I mentioned earlier, came out to Ceylon in 1876 as an Assistant to Principal G. Todd of the Colombo Academy. He had played cricket in the best company in England representing Swansea (later Glamorgan County CC) even against the MCC at Lord's in 1875. As their "Boarding Master" he taught the boys the game with enthusiasm. In fact he was responsible for starting the First ever Inter-School Cricket Match in Ceylon in 1879, between Royal College and St. Thomas' College, now famed as the "Battle of the Blues". Walker was also responsible for initiating the first "Europeans vs Ceylonese" Cricket Match in 1881 producing cricket of a high order, which in turn played a major role in uplifting the overall standard of play here; In fact what Lord Harris did for England Cricket, Mr. Walker did for Ceylon Cricket. The pioneering sponsor, selector, captain and arbiter, all 4 in 1 of Ceylon Cricket was George Vanderspar (Somerset), a Dutchman. In fact His association with the M.C.C. authorities, enabled him to originate the 'Whistle Stop Matches" in Colombo for the M.C.C. (this was how the England team sailing out of the UK was known then) on its way by ship to Australia. The first International team thus to visit Ceylon was of Hon. Ivo Bligh's English team in 1882, followed by G. F. Vernon's team in 1884. The credit for initiating the idea of sending Ceylon Cricket Teams overseas (the first overseas tour was to Calcutta India in 1884) and also introducing coir matting for cricket here, belongs to this Dutchman. His efforts also saw two Ceylonese School Boys, Colvin Kelaart and Allan Raffel (both from Royal College Colombo) for the very first time being given an opportunity to play for All-Ceylon. He was also responsible for starting the Colombo - Madras annual cricket series, visiting each other in alternative years. 1889 saw the first 'Un-Official' Test against All-Ceylon, a three - day match against G. F. Vernon's English Team at the present Bogambara Grounds in Kandy. From 1880 to about 1910, the exclusive European Colombo Cricket Club (formed in 1832 - see paragraph five above), was the dominant factor in Ceylon Cricket. Arranged by Ashley Walker, the first match of the series that continued until 1933 between Ceylonese led by A. C. Edwards and Europeans under Colombo Cricket Club and led by Ashley Walker, took place in 1881. The Colombo CC based at Galle Face Grounds, in 1894 shifted to its new location at Maitland Place in the Cinnamon Gardens area of Colombo. This made George Vanderspar to purchase the Galle face Grounds and form the Colombo Sports Club, the first proprietary Club. Samuel Peter (S.P.) Foenander M.B.E., the eminent cricket journalist in the (1910 - 1960) period and known as 'Ceylon's Walking Wisden', rendered yeoman service to the game and helped to put Ceylon on the 'Cricket Map of the World'. In 1913, due to the untiring efforts of him and Dr. John Rockwood, a committee drawn from the Cricket Playing Clubs in Colombo (minus Colombo CC) was established to run the game in Ceylon. This turned out to be the starting point of the Ceylonese taking over the administration of Cricket in this Country from the Europeans who did the job until then. Dr. Rockwood's visit to England in 1920 at his own expense and with the help he received from Dr C. H. Gunasekera there then, led to the formation of 'Ceylon Cricket Association' in 1922 (this was liquidated in 1965). It was their effort that saw the hiring of the first professional coach, W. C. Razor - Smith from Surrey England, to improve the standards of the game in Sri Lanka. Having learnt the rudiments from the masters, and given their natural abilities blessed with the basic ingredients required to be a natural cricketer, it was not long before the pupils got into their own. Amongst many such talented Ceylonese, the first notable perhaps was Douglas de Saram, a powerful cricketing personality. He along with his brothers Shelton, E.R. (and Fred), emulated the famous 'Grace Brothers', W.G., E.M. and G. F.(1880) by turning out together for their Country (against Australia ) in 1912. Then came another Cricketer, Dr. C. H. Gunasekera to play a significant role in the further development and promotion of Cricket in Ceylon; He was the youngest of another quartet of 'Cricketing Brothers', D.B., E.I., V.R. and C.H. After Schooling at Royal College Colombo, he left for England in pursuit of a medical degree. If not for the World War - one that broke out, he was a certainty to gain his 'Blue' in the first year itself at Cambridge. He was later invited to play for Middlesex CC under Sir Pelham Warner and thus became the first Ceylonese to play for an English County that even won the County Championship (1920 & 1921) in his days with them there. He then became the conduit through whom the local administrators worked with the M.C.C. Helped by the formation of the Ceylon Cricket Association (C.C.A.) in 1922 as said before, many a M.C.C. team passing through Ceylon by ship, broke journey here to play a match in Colombo, which in turn further helped to promote and develop the game here. In 1946, C.C.A. sought membership for Ceylon in the Imperial Cricket Conference, without any luck. BIRTH OF THE CEYLON CRICKET BOARD ( BCCC ). The desirability of forming a Board of Control for Cricket in Ceylon (BCCC) came about, as a result of certain players refusing to play in the C.C.A. teams against a visiting team from India, (the Ranji Trophy Champions led by C. K. Naidu). The first proposal was made for its formation in 1939, at a committee meeting of the C.C.A. Restrictions due to the Second World War then, made them to postpone this decision till the end of the War. The Ceylon Schools' Cricket Association was born on 11th October 1946, with Rev. Cartman, Principal of Wesley College Colombo as its founder President. A historical inaugural meeting held at the Malay Sports Club Pavilion, Rifle Green Slave! Island on June 25th, 1948, saw the birth of a new controlling body for Cricket in Ceylon (BCCC) with Pakiasothy Saravanamuttu as its founder President. They then set about promoting the game in earnest and we witnessed much cricket activity in Ceylon in the next six years, that included many tours here of two-weeks duration, first by West Indies followed by Pakistan, India, Australia, and England, notable one being the initiation of the annual Gopalan Trophy matches with Madras. In 1949 at Calcutta, saw the establishment of Asian Cricket Conference, on 5th January. Ceylon together with India, Pakistan, Burma and Malaya sat together to plan out a program for the development of the game in this region. In fact in all too short a life span, Pakiasothy Saravanamuttu achieved a miracle for Ceylon Cricket. At the height of World War II, he was the Architect and also the Builder of the First Cricket Stadium (Colombo Oval) in the short span of three years. "P. Sara" , the fond way he was popularly known as, passed in to the Ceylon Civil Services and served the British Government for nearly three decades of time. After his untimely death, BCCSL offered a Trophy in his name for Division I Clubs in 1950 / 51 season. But he will be remembered best as the person to begin the tradition of providing employment in Government Departments under his supervision to the best Public School Cricketers, such as in Tea Control and Rubber Control Departments. Robert Senanayake is best known in Sri Lanka Cricket Circles for his long connections with the administration of the game (1957 - 1976 as the President of the BCCSL). Known as the 'Devoted Servant of Ceylon / Sri Lanka Cricket', he deviated from the family traditions and abandoned politics for Cricket and Business. It was during his tenure of Office that India sponsored Ceylon for the ICC associate membership and Ceylon was elected an 'Associate Member' on 16th July 1965. To help Ceylon soon gain thereafter ICC Full-Membership, in 1966 he initiated the first three-day Cricket tournament in this Country. It was the British who first introduced Cricket and Coffee followed by Tea to this country. Like our Cricket, the epic saga of Ceylon Tea, (an infusion made by pouring boiling water over the dried leaves of an evergreen plant termed "Camellia Sinensis"), continues to enthral the world and challenge those who follow in the footsteps of the indomitable pioneer planters. The cricketing voyage started over 150 years ago and the adventure of Tea, about a decade later. It all began around 1865 when a leaf disease ruined almost overnight the coffee industry in then Ceylon. The coffee planters, financially broken but undaunted in spirit, saw the possibility of transforming a mere 70 odd hectares of land that had tea, into the beginning of a completely new industry here and, with great determination set about replanting with the tea bush, the waste-land where once coffee had flourished. The rise of Ceylons tea plantations over the grave of the coffee industry into an even greater and enduring industry, is a fascinating story. 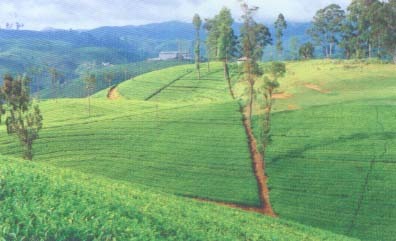 In 1867, on 19 acres at Loolecondra Estate near Kandy, James Taylor, a Scottish planter, planted first tea to be grown commercially. It became the model for future development, not only from the point of view of cultivation, but also by being a self-contained unit with its own factory. The first shipment of tea in 1872, five years later, was only two small packs containing 23 pounds valued at a mere Rupees 58 (fifty eight), a literal drop in the ocean compared to the 280 million kilograms the country exported in 2002. But, those were hard times when methods of manufacture under difficult growing conditions requiring highly skilled, scientific and technical processes, were woefully primitive. The pioneers went on to fight back the jungle to bring an ever increasing area under cultivation. In just seven years time, six-fold increase of acreage of tea were already flourishing and by the year 1900, the real fruits of labour were being gathered from 120,000 hectares of shimmering tea land. Today, over 220,000 hectares are planted with an average annual production exceeding over 290 million kilograms of tea to be ranked as the 3rd biggest tea producing country globally. Today, Sri Lanka is the largest exporter of value-added teas in the world and commands a 20% share of all tea traded globally. Ceylon Tea from Sri Lanka have been researched and developed to cater to the varied tastes of tea drinkers all round the globe. Consumers in over 60 countries delight in the pleasure of a cup of "Ceylon Tea". One reason for its continuing popularity is that no harmful properties have been associated with tea over the period of more than 45 centuries since the time of its discovery. Tea is exported in different forms and in different popular pack sizes, according to market requirements. A complete range of tea bags, a wide range of packs of packeted tea, a variety of flavoured tea are the major exports along with soluble instant tea, green tea and bio tea. Sri Lanka also enjoys the distinction of conducting the largest tea auctions in the world which has been in operation since 1883.